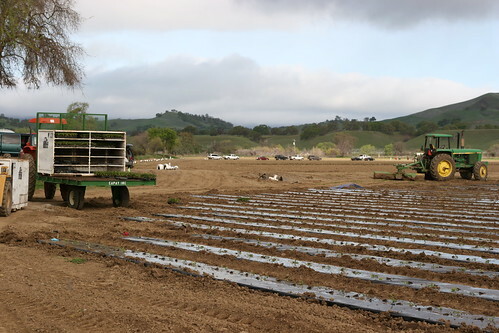 At Farm Fresh To You, there is nothing more exciting than meeting another company that creates a great product and supports their surrounding community and environment in the process. 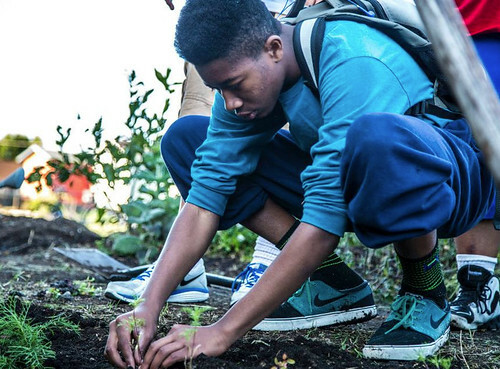 Meet Phat Beetz Youth Pickle Co. (PBYPC), a social justice movement that aims to create worthwhile jobs for Oakland’s youth while promoting local farmers, supporting community gardens, and funding food justice with the sale of delicious, pickled veggies. 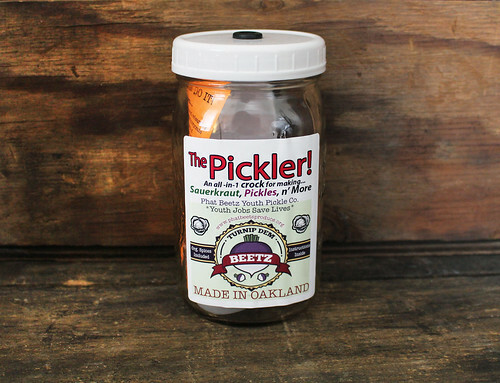 Photo provided by Phat Beetz Youth Pickle Co. Most food that comes in jars has been pasteurized, which eliminates any chance of contamination, but also radically reduces the nutritious nature of the food. Our digestion system requires the help of good bacteria living in our intestines. Mass-produced, pasteurized foods have neither good nor bad bacteria in them, but fermented foods are made with microbiotic cultures, and eating them has been shown to replenish our essential bacteria. If you have ever considered pickling your veggies or making your own signature Kraut, PBYC has come up with a fool-proof pickling kit that takes the guess work out of creating delicious pickled snacks. And the great news is, you can continue to re-use The Pickler! kit and try out different spices and recipes in your quest for the ultimate pickle. As we move from spring to summer, pickling is a great way to enjoy your favorite spring veggies throughout the rest of the year. We decided to try out the The Pickler! kit with the kids. 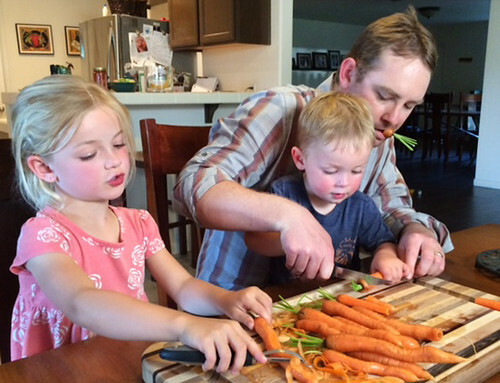 With a handful of little helpers, it didn’t take long to prep the veggies, add spices and water. It only takes 5+ days for your veggies to transform into delightful, pickled snacks. Check out our recipe for Spicy Pickled Carrots on our blog. Put spices that you like on the bottom of the jar. Some of the more popular spices include allspice, bay leaves, cardamom, cinnamon, cloves, coriander, ginger, mustard seeds and peppercorns to name a few. Put 1 grape leaf, oak leaf (tanins) at the bottom to keep them crispy. Wash produce and chop into pieces (you decide how big). Pack into jar to the top of the label. Make brine: mix about 2 + tablespoons of salt with a 16 oz (pint) of the best water you got (sea salt or mineral is best). Pour brine over veggies till the fill line. Put lid on with air lock and wait 5+ days, then taste! How To Add The Pickler!, Carrots, Beets & Other Pickling Veggies To Your Delivery: CSA members - head on over to our online Farm Stand Market to customize your upcoming delivery. Market is open from noon on Thursday until 10 am, 2 days before your scheduled delivery day. After you confirm your produce items, click the orange button "Confirm and Continue To Other Farm Products" to add the products to your delivery. 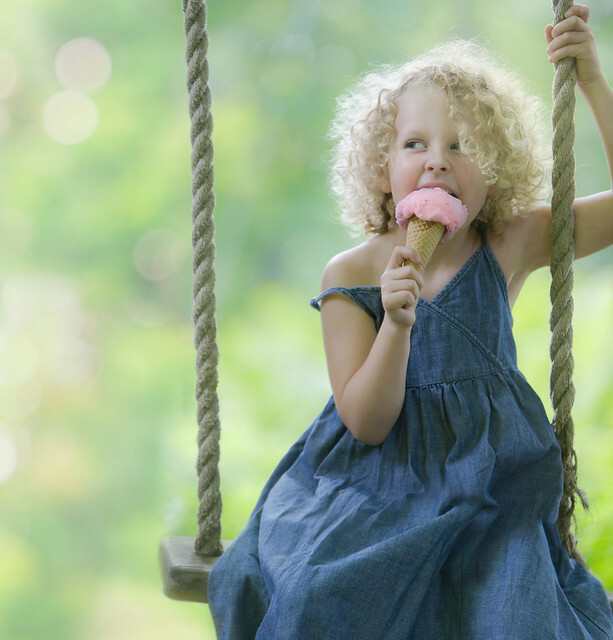 Who doesn’t love cold and delicious treats on a warm day? Who doesn’t love Memorial Day weekend? Just as I suspected, nobody. 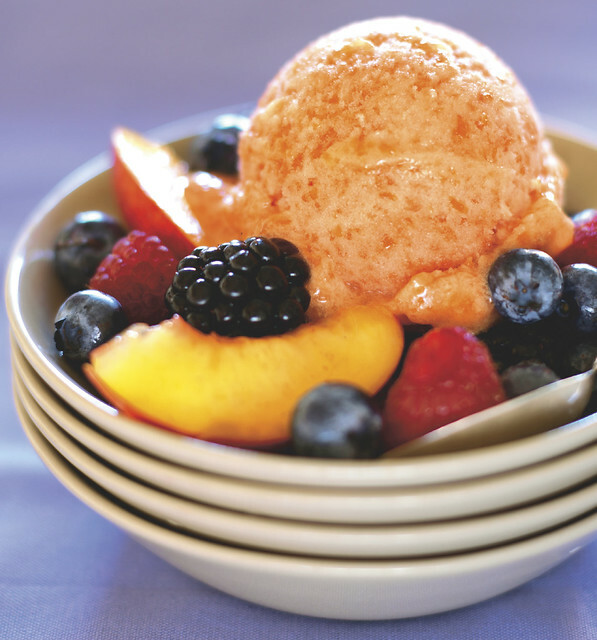 The weather is getting warmer and amazing strawberries, blueberries and nectarines are coming into season as we speak. Memorial Day is the perfect excuse to throw a family get together and make some seasonal sweet treats for your guests. 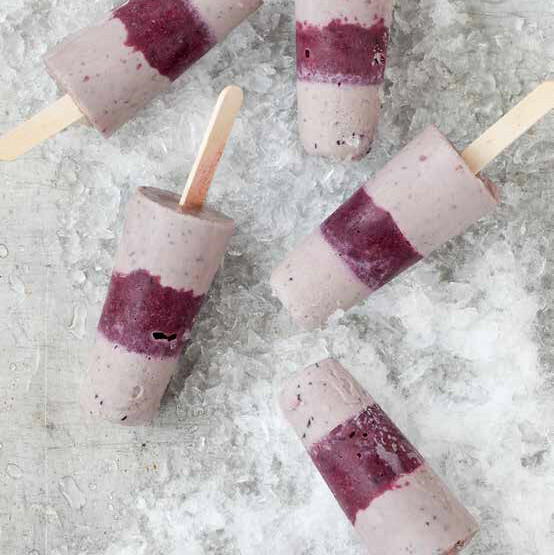 We wanted to share a few of our favorite frozen treats that have a healthier spin. Yes, you veganistas, we are throwing you some Memorial Day love with delicious recipes that you can enjoy with everyone! 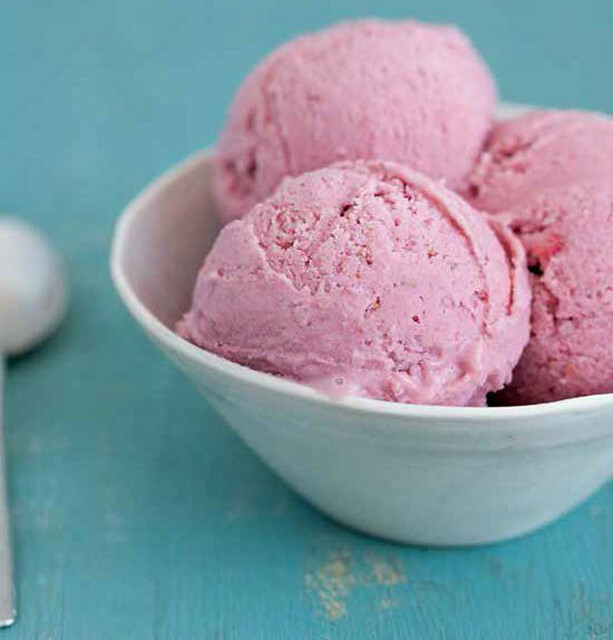 Give these recipes a try and look for our Vegan Ice Cream book giveaway this summer. Run the strawberries through a juicer to make 2-1⁄2 cups juice. Combine the strawberry juice, cashews and syrup in a blender. Blend on high until silky smooth, at least 1 minute. Recipe reprinted with permission from Vegan Ice Cream by Jeff Rogers, copyright © 2004, 2014. Published by Ten Speed Press. Slice the nectarines in half and remove the pits. Cut the unpeeled nectarines into small chunks and cook them with the water in a medium, nonreactive saucepan, covered, over medium heat, stirring occasionally, until they’re soft and cooked through, about 10 minutes. Add a bit more water if necessary during cooking. Remove from the heat and stir in the sugar. Let cool to room temperature. When cool, purée the mixture in a blender or food processor until smooth. Stir in the kirsch or lemon juice. The Perfect Scoop credit: Reprinted with permission from The Perfect Scoop, by David Lebovitz, copyright 2007. Published by Ten Speed Press, an imprint of Penguin Random House LLC. Place the chopped blueberries in the freezer to chill. Run the whole blueberries through a juicer to make 2 cups juice. Combine the blueberry juice, cashews, syrup, vanilla flavor and almond flavor in a blender. Blend on high until silky smooth, at least 1 minute. Place the blender in the freezer for 40 minutes to 1 hour or in the refrigerator for at least 1 hour or up to overnight, until well chilled. Pour the mixture into an ice cream maker and freeze according to the manufacturer’s instructions. Remove the cover and blade from the ice cream maker and fold in the chopped blueberries, distributing evenly. Serve immediately or transfer to airtight containers and store in the freezer until ready to serve. How To Add Strawberries, Blueberries, Nectarines, Lemon & Maple Syrup To Your Delivery: CSA members - head on over to our online Farm Stand Market to customize your upcoming delivery. Market is open from noon on Thursday until 10 am, 2 days before your scheduled delivery day. After you confirm your produce items, click the orange button "Confirm and Continue To Other Farm Products" to add the products to your delivery. Keeping yourself hydrated is necessary for good health - yet how many of us forget to drink enough water throughout the day, or just plain don't like the way it tastes? Try infusing your water with the wonderful flavor of fresh herbs! 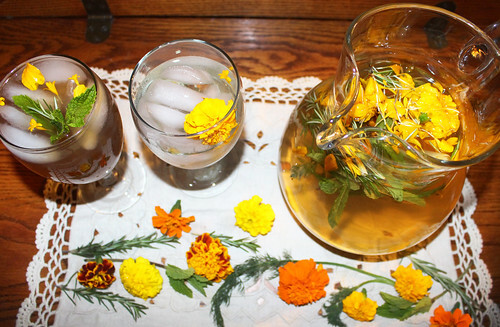 We offer an Herbal Beverage Kit that includes a fantastic blend of rosemary, dill, mint, lemongrass and edible flowers that adds depth and a wonderful refreshing taste. Assembling your kit is as easy as 1, 2, 3! 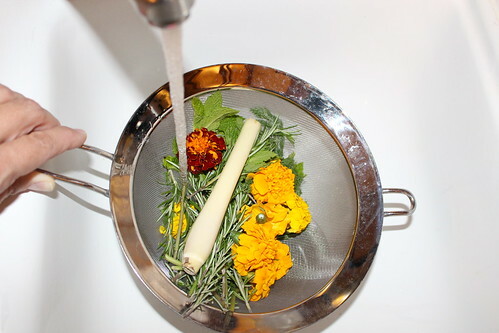 Gently rinse your herbs before you use them, then fill a one gallon dispenser with your desired herbal beverage starter (water, sparkling water, tea, lemonade, etc.). Using your hands, crush the herbs a bit to release their natural flavors, then add them to the dispenser. Use more or less herbs based on your flavor preference. Stir vigorously to blend. 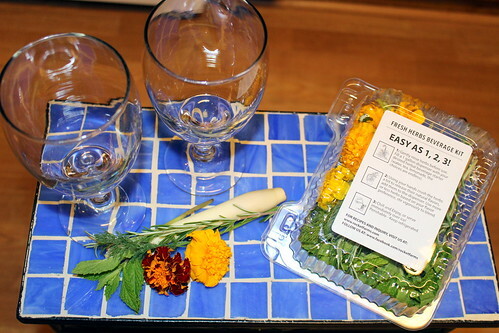 Chill and enjoy - or serve immediately by straining, pouring over ice, and garnish with fresh leaves and flowers. Additional flavor ideas: add fresh berries, citrus, cucumber slices, melon - the possibilities are endless! The longer your beverage stays in contact with your herbal mix, the stronger the flavor will be. Store your beverage in the refrigerator up to one week. Mary B. - Hooray for the Beverage Kit!!! First time batch...Using a gallon container, it began with 8 ounces of strawberry lemonade (a guilty pleasure from a chain restaurant)..added 6 bottles of spring water....added kit, as directed, crushing and breathing in the delicious aroma of the herbs...left in fridge for 24 hours......now enjoying the satisfying flavors over ice in a tall glass.....mmm this is treat!!!! ooh, perhaps to freeze some in an ice cube tray to be run through the snow cone maker..........aah the possibilities are endless..thank you for the Beverage Kit. It was a splurge turned magic recipe starter....five bucks went far!!! Meg R. - So excited for the herbal beverage kit! It smells fantastic! Thanks for such a great service! Crystal H. - The kit took smoothies to a new level! Avocado, blueberry, strawberry, apple, banana, creamy almond butter, unfiltered wildflower honey, all items from the Herbal Beverage Kit (mint, dill, rosemary, lemongrass, marigold petals) and some flaxseed (the only ingredient not conveniently delivered to my doorstep). CSA members - head on over to our online Farm Stand Market to customize your upcoming delivery. 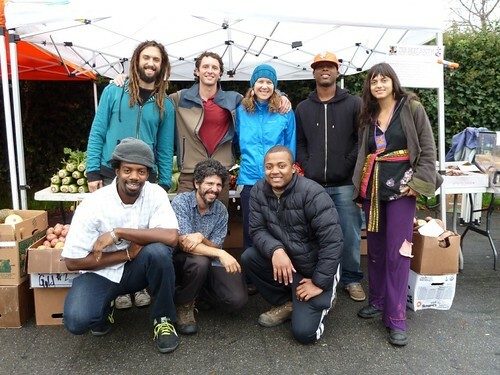 Market is open from noon on Thursday until 10 am, 2 days before your scheduled delivery day. 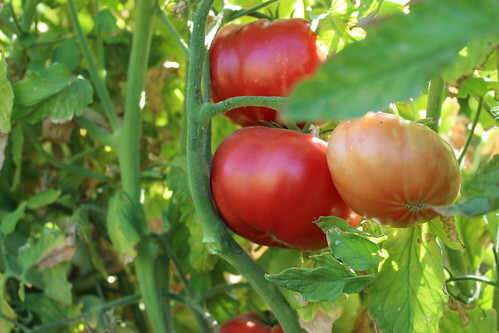 Tomatoes are a force of nature that require focus every month of the year. 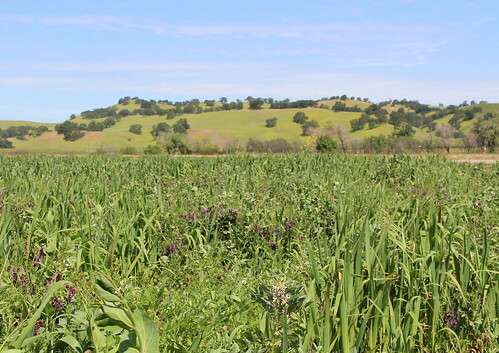 When the harvest is done before the rains arrive, we need to know which fields will house next year’s crop so that we can adequately prepare the land for a planting of cover crop that is early enough to be tilled into the ground in time for the spring planting. As the cover crop grows and the hills turn green with the winter, small tomato seeds are sown into the protection of the greenhouse just after the New Year. Tomatoes, originally of tropic origin, can’t handle one degree below freezing, so we wait until we are confident the last frost has come and gone before we pull the little plants out of the greenhouse and tuck them into the soil where they will battle the elements with little control from their farmer. On our farm, this generally happens on March 15. As long as I have been around, I have never seen a frost after March 15 – the significance of this date to me is up there with my birth date! 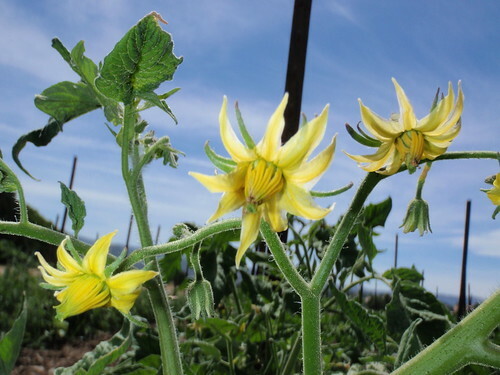 Tomatoes grow slowly in the spring while the hills are still lush with green grass. 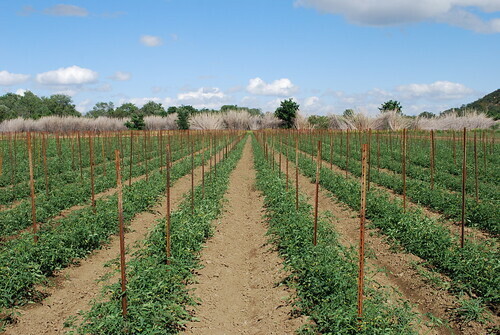 The tomato plants drill their roots deeper and deeper into the soil. Then summer slowly arrives, a day or two at a time of warm weather. The hills begin to lose their lush, green look. The oak trees darken up a shade, and the tomatoes grow like weeds. Spring settles back in, temperatures cool and maybe a drizzle of rain revives the grasses on the hills, gasping for their lives. This dance happens and then a week of “summer” weather arrives as it did last week on our farm. The tomatoes shoot up, and this year, we are thankful to have the stakes in on time. 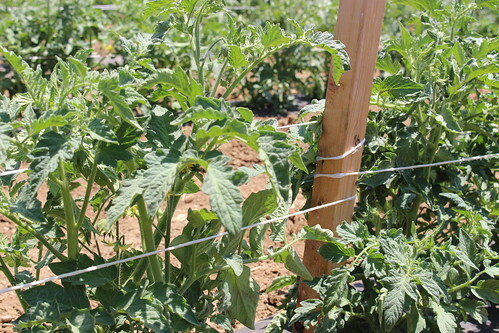 The crew escorts the tomatoes vines against gravity and toward the sun on the support of the temporary metal stakes and string system we have perfected. The focus on growing the tomatoes is huge. I walk through the fields letting my hands brush along the sticky tomato plants, their tiny fuzz easily visible in the sun. Kneeling down in the soil, I admire the little, yellow flowers that are the beginning of the fruit, which will grow to mark the finale of summer in Capay. My hands are covered in tomato musk, a greenish / yellow layer that finds its way into the crevices of my fingerprints and nails. The smell is unmistakable – tomato. 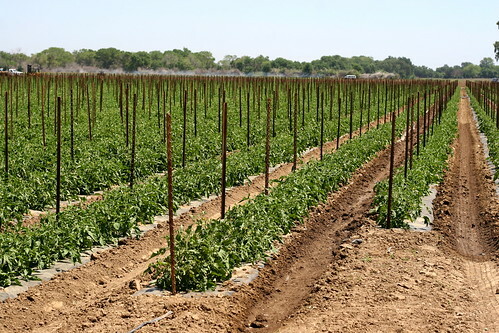 Putting my hands to the my nose, I breathe in the fragrant smell and stop for the first time to look around and enjoy the army of stakes neatly put into the ground and the rows of tomatoes standing in formation like soldiers in a drill formation. It is only then that I notice the hills are no longer green; they are completely golden. The warm weather that pushed the tomatoes so fast painted the backdrop of the hills the golden summer color that will hang with us through the season. 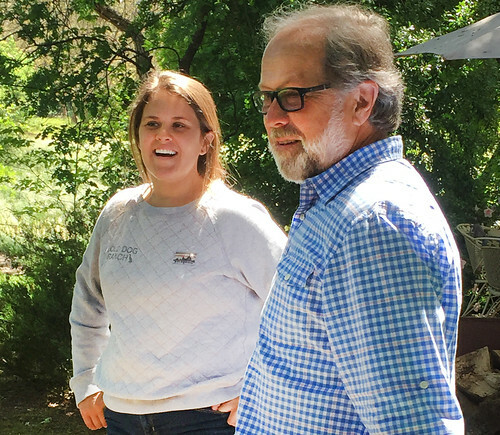 We are thrilled to introduce you to this charming father-daughter duo, Roger and Mollie Sitkin of Old Dog Ranch. Their combination of talents is a perfect blend of old school farming with some trendy new school flavors, recipes and spices. 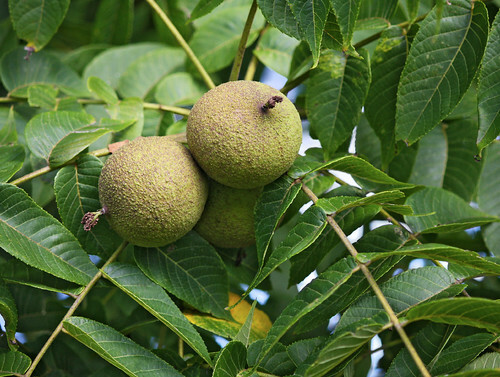 Walnuts are the forte of this fifth-generation family farm, named after the family’s two long-lived canine companions (Mollie Dog and Poppy). 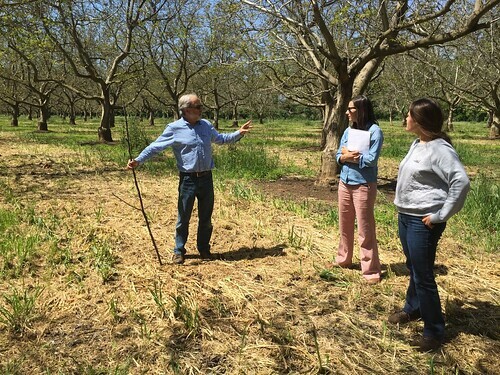 Located in the foothills along the Calaveras River in the San Joaquin Valley, Roger and Mollie were kind enough to give us a tour of their lovely spring walnut orchards while giving us the scoop on their history, aspirations and upcoming plans. Roger Sitkin farms the walnuts, while his daughter, Mollie Sitkin, is responsible for creating and developing recipes for the family’s walnut products, including the addicting Mexican-Hot-Chocolate-Flavored Walnuts and the heavenly Raw Honey & Sea Salt Walnut Butter. I wasn’t even aware that walnut butter existed, however, I am a happier person because it does. 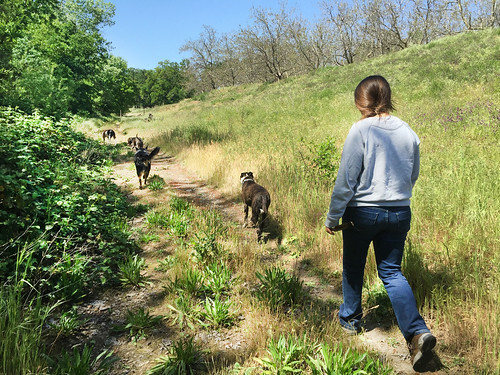 One of the Sitkins’ three walnut orchards will be certified organic in October and another is currently transitioning to organic. 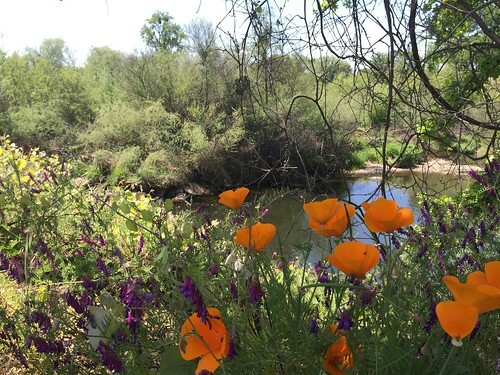 Because their ranch and walnut orchard borders the Calaveras River, it has always been important to the Sitkin family to farm sustainably. 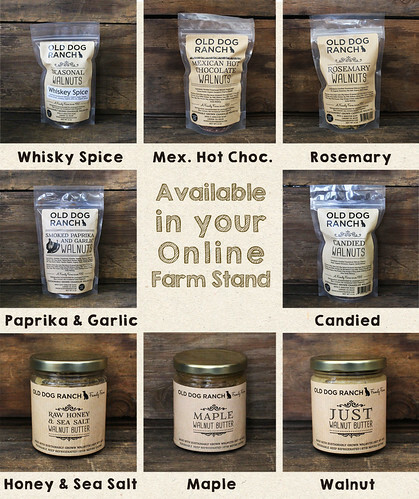 It was such a treat to tour Old Dog Ranch, meet their furry friends and taste some of their fun new walnut creations. If you haven't already added a few of their delicious products to your delivery, I highly recommend that you do before they're all snatched-up.